A study of four days in Marie Antoinette's court at Versailles on the eve of revolution, from the perspective of one of her maid-servants. LIke Coppola's movie, 'Farewell, My Queen' examines the lavish luxury of the Queen and her court, but ther extravagant lifestyle gains greater impact in Jacquot's film because it is set against a background of rapidly approaching disaster. Part of Jacquot's movie is set 'downstairs', in the world of the lower-class servants, chiefly women. 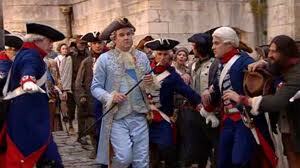 Louis XVI hardly figures in Jacquot's film, although he is shown as having more courage than hs royal court. The Queen's favorite, Gabrielle de Polignac, and the subject of Marie Antoinette's infatuation. 'Farewell, My Queen' emphasises Marie Antroinette's isolation in the midst of the crowded surrounds of her court. Diane Kruger as Marie Antoinette, with child and husband Louis VVI. 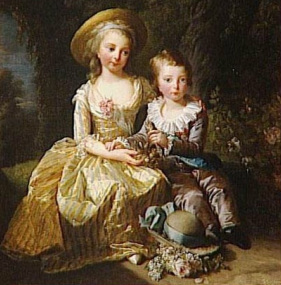 Marie Antoinette's two children -before 1789. Marie_ Therese survived captivity; her brother the dauphin did not. 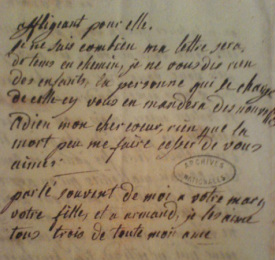 Letter , written 1790, from Marie Antoinette to Gabrielle de Polignac, in which the Queen declares that "only death can make me stop loving you". Director Jacquot with star Diane Kruger. Director Benoit Jacquot's 2012 movie focuses on the events of 14-17 July, 1789, as the Marie Antoinette (DIane Kruger) and the rest of the royal court and household at Versailles gradually realise that the revolution in Paris is gradually reaching out to enfold them in its grasp. This realisation and its impact is mainly examined through the eyes of one of the Queen's servants - her 'reader', Sidonie Laborde (Lea Seydoux). Sidonie is quiet, thoughtful and fond of Marie, but like everyone else at Versailles, caculating and shrewd.lThrough her eyes we observe the increasing panic of the nobility as the Paris crowd advances on Versailles and the betrayals, deceits and compromises that occur as the nobility and their servants try to protect themselves. Another feature of the film is that it portrays the Queen as infatuated with her female favourite, Gabrielle de Polignac. One of the chief characteristics of Jacquot's oeuvre of nearly twenty movies is his fondness for literary adaptations and costume dramas. Jacquot's films also frequently how women cope with the pressures of social, familial and gender expectations. Many of his female characters are placed in a crisis situation in which they have to fend for themselves. He frequently uses female stars who project an aura of decisiveness and intelligence. His films include Tosca (2000), A tout de Suite (2004), L'Intouchable and No Scandal. Marie Antoinette with husband Louis XVI. One of the most interesting aspects of this movie is its contrast between the luxury and extravagance of privileged 'upstairs' Versailles of legend, and the cramped, dark, squalor of its 'downstairs' aspect. These two distinct settings are linked by the fact that the two different social orders that inhabit them share common traits of ambition, fear, and affection. This feature distinguishes 'Farewell, My Queen' from both Sofia Coppola's version and its 1938 predecessor which have little interest in examining the lives of the serving class as Versailles. Jacquot's film has more in common with the brilliant 'Ridicule', which looks at the Versailles court through the eyes of an intelligent and humane member of the lower aristocracy, alienated from the world of privilege and luxury that he observes but forced to join it in order to achieve his aim of improving the lives of the under-privileged in his region. The figure of Louis XVI occupies only a few minutes of screen time in this movie. he seems a colorless non-entity, but he is one of the few characters to display any sense of honor and dignity as he opts to leave Versailles to confront the revolutionaries in Paris. Marie Antoinette, on the other hand, is the focus of the 'Farewell, My Queen'. Diane Kruger's portrayal has considerable depth and subtlety. Like Kirsten Dunst's Queen, this Marie Antoinette basks in luxury and frivolity, and takes her life of privilege for granted. She has little understanding of the political catastrophe that is about to overwhelm her and her class. Yet in Kruger's depiction, and as seen through the eyes of her personal reader, Sidonie, she can be a kind and sympathetic woman, lonely and isolated, in desperate need of honest friendship, cruelly cast out of her depth in a crisis beyond her comprehension. According to the popular gossip sheets, pamphlets, songs and poems that preceded and accompanied the Revolution, Duchesse Yolande Gabrielle de Polignac, the beautiful wife of the powerful Duc de Polignac, and the Queen were lovers, a view not discouraged by the movie. Historians agree that over the years similar allegations, most of them completely unsubstantiated, of the Queen's amorous lifestyle damaged the monarchy in popular opinion. They also agree that Gabrielle used the Queen's infatuation to ensure that the Polignac family profited financially and politically from this friendship - much to the jealousy of others in the Court. Money, posts, titles and appointments flowed from the Queen and King to the Polignacs. However, there is some disagreement over exactly how avaricious and ambitious Gabrielle was; some see her her as a cold-blooded seeker of power and wealth, others prefer to paint her as the victim of others' greed and ambition. The film's (fictional) depiction of the Queen's personal reader, Sidonie, adds considerable interest. Sidonie is intelligent and fond of the Queen, but - like all those around her and the Queen, servant or noble - she has her own agenda and is determined to use her role as reader and her good relationship with the Queen to advance herself. She also seeks to protect herself against the oncoming disaster. This perspective on the lifestyle and attitudes of the unprivileged who are surrounded by extreme wealth, power and luxury gives "Farewell, My Queen" a refreshingly new and different outlook. Even today details about the lives of the Versailles servants like Sidonie remain obscure. There are thousands of images of the luxurious rooms of Versailles, but none of the servants' quarters. 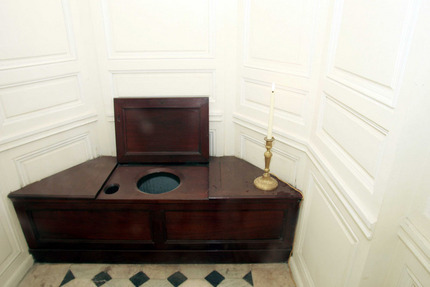 We have photos (below) of Marie Antoinette's toilet but the sanitary facilities of her servants remain unknown. Details of the courtiers' magificent costumes and dresses are readily available but there is little information about servants' clothing. 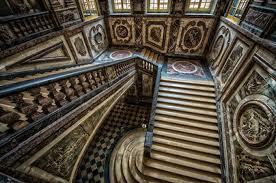 And at least the images of the miles of steep, winding stair-cases provide evidence of the physical effort that must have been involved for servants rushing about to provide for their mistresses' and masters' needs. oThe artist Elizabeth Louise Vigee Le Brun who painted this controversial 1783 portrait of the Queen (on left) observed noted that her restlessness made her a difficult subject to portray. Vigee became the Queen's official artist. 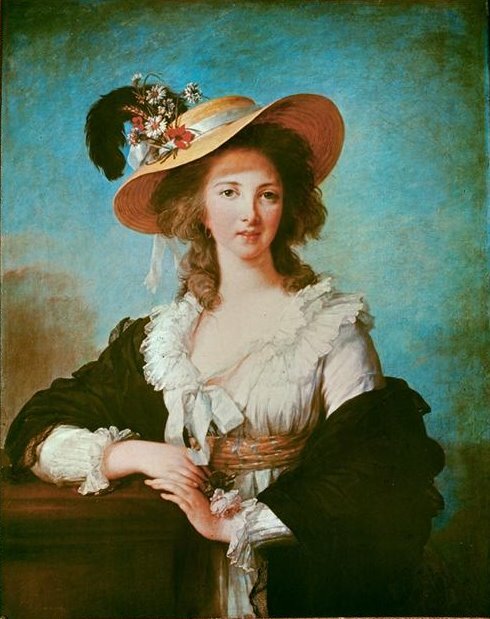 This portrait was regarded as scandalous by the French public, who were shocked by the (comparatively) simple white English-fashion Muslin dress, the informal straw hat and complete lack of ornaments, and the smile (undignified!) The artist was forced to replace it with a version depicting the Queen in an elaborate French-style silk dress and an elaborate coiffure,shown on right. Portrait of the Duchess de Polignac at the height of her influence. 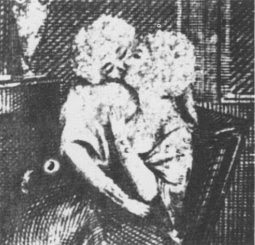 Illustration from Parisian scandal sheet alleging lesbian relationship between the Queen and Polignac. Some revolutionary era pamphlets, sheets etc that played such an important role in influencing public opinion about the King and Queen and their aristocratic friends. 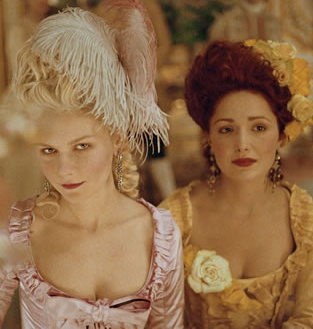 Rose Byrne (right) as the Duchess in Sofia Coppola's movie. 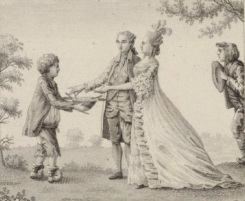 Anonymous c.1791 cartoon mocking the royal family's attempted escape to Varennes that year. It shows Marie, Louis, the dauphin, the Princesse Royale (daughter) and the King's aunt trying to jump from the Tuileries. Etching c.1790s The Radical's Arms. No God! No Religion! No King! No Constitution! Pro-monarchist illustration showing the royal couple as charitably helping the poor, while a grateful citizen looks on. 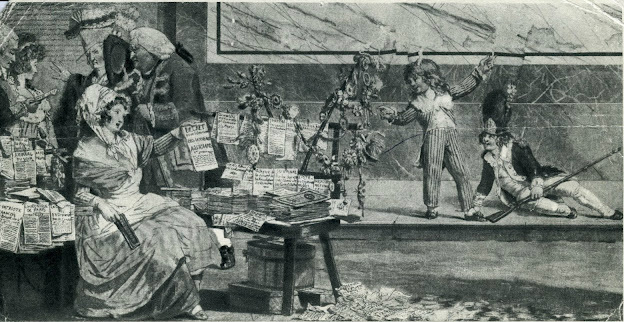 Newsagent in France -late 18th early 19th Century selling pamphlets,and newspapers. The French 'tabloid press' played a key role in the overthrow of the monarchy. Unfortunately, Thomas fails to recognize that scandalous depictions were not confined to Marie Antoinette. Louis XVI was subjected to an equally vitriolic attack and his sexual and moral attributes were just as viciously attacked as were the Queen's. So too were the manners and morals of others at the Court, male as well as female. This aspect has been more recently discussed in a superior study, The Body Politic by Antoine Baecque. The author points out that French popular literature of the late 18th Century habitually used images of the body, both male and female, especially the bodies of the King , Queen, aristocrats and revolutionaries alike to both condemn and praise. Thus Louis was depicted as impotent and flaccid, Marie as bestial, and the aristocracy as monstrous. Images of women revolutionaries, far from denigrating either their bodies or their abilities, depicted them as heroic leaders, models for their menfolk to emulate. Madame Sans-Cullotte - the revolutionary woman as placid domestic. Even Batman comics used the image of Marie Antoinette as an ironic (sexual?) subtext. 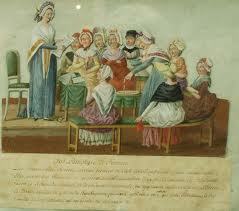 Women's Political Club in France, 1790. Jacquot's movie refers to one of the lesser charges against the Queen, that of lesbianism, especially in relationship to her friend and confidante, the Duchesse de Polignac.The Duchesse de Polignac is as controversial a figure as Marie Antoinette herself. Indeed, controversy seems to have followed her descendants -her great-great-great-great grandchildren are the Princesses Caroline, Stephanie and Prince Albert of Monaco. She was born in 1749, and was thus six years older than Marie Antoinette. Like the future Queen, had an arranged marriage (at age 17) to Count Jules Polignac, who came from a proudly aristocratic but financially embarrassed family which had for centuries clung close to royal power and influence. There are two divergent views of the duchesse. The dominant view, largely supported by historical evidence, is that Gabrielle assidiously worked to obtain favours, wealth and influence for herself and the Polignac family. She first met Marie in 1775 and immediately the two became close friends. Gabrielle insisted, however, that she would not move into the court unless her husband was given a lucrative post and the family debts were paid. She used her shrewdness to inveigle her way into the affections of not only Marie Antoinette, but KIng Louis and his young brother. These invaluable connexions produced an outpouring of royal patronage on a scale that astounded and infuriated other courtiers, jealous of the privileges bestowed on the Polignacs. Louis actively encouraged the friendship between the older, more assured woman and his often lonely, easily distracted wife: he believed that Gabrielle had a calming influence on the Queen. The younger Marie appears to have relied on the ambitious older woman and mother of four for advice on matters social, sexual and gynaecological.Polignac certainly used her friendship to accumulate favours and privileges to an extent unequalled by any other royal favourite in Louis' court. In 1782 she was given the prestigious title of Governess to the Children of France (i.e. to the royal children) and a thirteen-room apartment in the palace, as well as her own 'cottage' near the Queen's beloved Hameau de la Reine, a faux Disneyfied rural homestead. The most serious charges against Polignac's influence on the Queen are political. 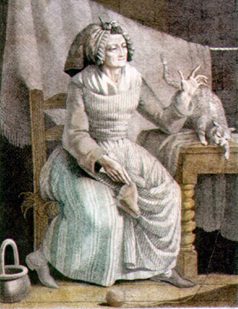 She encouraged Marie to become encapsulated within a lifetsyle completely detached from the social and political realities of late eighteenth century France. Under her guidance the Queen not only became a symbol of frivolity, laziness and excess, completely divorced from the needs of the enormous majority of her subjects. She also became the easy target for slander and gossip, thereby combining allegations of immorality with profligacy. The Duchesse's political stance also had unfortunate repercussions for Marie. In 1789 Gabrielle had become what would now be called a 'hard-liner'. She, along with the King's brother the Comet d'Artois, demanded a forceful response to the growing political and social discontent in Paris and the rest of France. Gabrielle, along with Artois and others successfully pushed the King to dismiss his chief minister Jacques Necker, one of the few who realised both the seriousness of the discontent and the monarchy's inability to crush it by armed force. Necker's sacking triggered armed insurrection in Paris. Defenders of Gabrielle correctly note that nepotism and corruption were hardly unique to the Polignacs; the entire court at Versailles was completely contaminated by it. Gabrielle was only doing what dozens of her rivals were doing, only more successfully. Besides, Gabrielle did not dominate the Queen's affections; Marie had another powerful favourite, the Princesse de Lamballe. 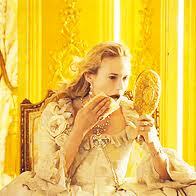 They also point out the jealousy that motivated other courtiers' hatred of the Duchesse. The allegations that Gabrielle was committing acts of gross immorality remain unsubstantiated - although she and the Comte de Vaudreille may well have been lovers. Again, such conduct was hardly unique at the court. Her defenders claim that the Duchesse was essentially a beautiful, witty, brave figure, caring and kind-hearted, who loved her children and protected the Queen. However, Gabrielle's behaviour when things turned bad tends to confirm the negative view of her as opportunistic. As early as 14 July she and her family fled Versailles and ended up in the safe haven of Switzerland. From there she carried on a correspondence with the Queen, an exchange which shows that Marie was still devoted to her. She had been unwell for some time and her condition worsened until she she died in 1793, a few days after the Queen's execution. Her supporters then and now claim she died of a broken heart, and her epitaph claims that "she died of sorrow". A more mundane explanation is that she died of either cancer or tuberculosis. 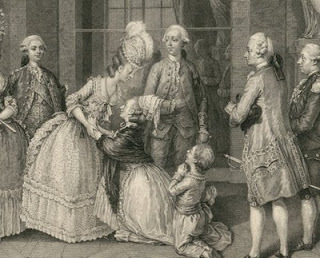 The Good Queen: illustration of Marie receiving thanks from family of M.de Bellegarde, for obtaining his release from imprisonment. 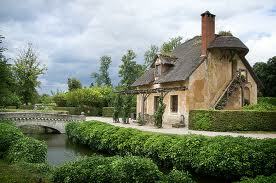 The Duchesse de Polignac was given the exceptional privilege of a 'cottage' near the Queen's faux village near Hameau de la Reine. 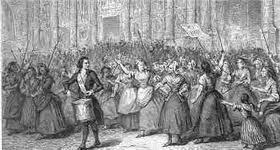 The 'Women's March' - angry at the rising cost of living and the scarcity of food, Parisian women, whose lifestyle was beyond the comprehension of the aristocracy, march on Versailles to present their demands, 5 October 1789. The next day the angry crowd forces the royal family to got to Paris.